Home » Rock Talk Library » What do you know about Gold? What do you know about Gold? This is an interesting metal. It is found worldwide and has many different uses; it acts as a catalysis (which is a substance that speeds a chemical reaction without itself being affected) there is minute traces of it in practically all the soils, which makes all the plants and vegetables grow better. Yes, these particles are giner than your finest flour and scattered very thin. It is used wherever a very good electrical connection is needed that will not wear out very soon, such as wiring in rockets and computers and expensive epuipment. And it is highly resistant to corrosion, but also because gold is easier to work than all other metals. In addition, gold was easier to obtain in the pure form than the other matels. Gold was used as currency and as a basis for international monetary transactions. The unit used in weighing gold is the troy ounce; one troy ounce is equivalent to 31.1 grams (or 12 ounces to the pound in the Troy Weight for gold). The major portion of the gold produced is used in coinage and jewelry. For these purposes it is alloyed with other metals to give it the necessary hardness. Green gold used in jewelry contains copper and silver; white gold contains zinc and nickel, or platinum metals. Gold is also used in the form of gold leaf in the art of gilding and lettering. I will bring some to show you. Gold is found in nature in quartz veins and secondary alluvial deposits as a free metal or in a combined state. It is almost always associated with varying amounts of silver. It is generally present to a small extent in iron pyrites and galena, the lead sulfate ore that usually contains silver. 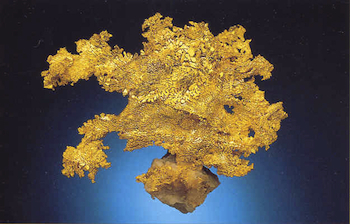 Gold also occurs in seawater to the extent of 5 to 250 parts by weight to 100 million parts of water. Pure gold is the most malleable and ductile of all metals. It can easily be beaten or hammered to a thickness of 0.000005 inches and 1.02 ounces could be drawn into a wire 62 miles long. It is one of the softest metals (hardness 2.5 to 3) and is a good conductor of electricity and heat. Gold is bright yellow and has a high luster. An experienced assayer can usually tell where gold is from by its color. Colloidally suspended gold ranges in color from ruby red to purple. Gold is extremely inactive. It is unaffected by air, heat, moisture, and most solvents. It will, however, dissolve in aqueous mixtures containing various chlorides and bromides. It will also dissolve in some oxidizing mixtures, such as cyanide ion with oxygen and hydrochloric and nitric acids. The chlorides and cyanides are important compounds of gold. Gold melts at about 1947 degrees fahrenheit and has a specific gravity of 19.3. The simplest process used for mining gold is panning, using a circular dish often with a small pocket at the bottom. The prospector fills the dish with gold-bearing sand or gravel, holds it under a gentle stream of water and swirls it. The light particles of gravel are gradually washed off and the gold particles are left near the center of the pan or in the pocket. You can also pan for sapphires and garnets up on the Missouri River; someitmes in some places you can pan for black sand which is worth more than gold, as it is a Rare Earth Element. You should have your sand tested by spectrograph, or have an assay on the sand and it will tell you what the different minerals are. The hydraulic method consists of directing a powerful stream of water against the gold bearing gravel or sand. For mining on rivers, elevator dredges are generally used. The elevator dredge is a flat- bottomed boat that useds an endless chain of buckets to scoop up the material from the river bottom and empty it on the dredge into a trommel (a container built for screening gold).